Classifications of the APW have been described differently in literature by investigators. , Proximal defects are the most common and are located in proximal aorta above the sinus of Valsalva. Distal types are located in the upper portion of the ascending before the aortic branches. Finally, total defects are large and involve the majority of the ascending aorta between valsalva and aortic branches. The clinical features of APW are not specific, but majority of patients have the manifestations of a large left to right shunt. Patients with small defects may be asymptomatic. Patients with large APW usually have symptoms of pulmonary hypertension and congestive heart failure (tachypnea, diaphoresis, failure to thrive, and recurrent respiratory difficulty) in the first weeks of life. Severe pulmonary vascular hypertension can occur in the first months of life. Two-dimensional and Doppler echocardiography could diagnose APW and could describe associated anomalies in majority of patients. Closure of the defect is offered in all patients with APW and should be performed as soon as possible. Without surgical correction, 40-50% of patients will die due to congestive heart failure during the first year of life, and a large number of survivors will suffer from sequels of congestive heart failure or pulmonary vascular disease in their lives. Gross first reported surgical ligation of an APW through left thoracotomy in 1952. Wright et al. described first transaortic closure of an APW after cardiopulmonary bypass use in 1968. Deverall et al. described using a patch to close of an APW. In this report, we have presented an 8-month-old boy with APW who was referred to our center by respiratory symptoms and heart murmurs. An 8-month-old boy, 6 kg, was referred to our hospital with a history of recurrent upper and lower respiratory infections, progressive tachypnea, and obvious chest retraction at rest and heart murmurs. In last examination his specialist hearing a suspicious moderate continious murmur and refer him to us. Cardiomegaly and pulmonary congestion were seen in chest X-ray. His cardiothoracic ratio was near 65% in chest X-ray. Transtorasic echocardiography showed moderate degree of mitral regurgitation (MR), dilated left atrium and left ventricle, severe turbulence flow in pulmonary artery and large APW (7-8 mm) and "T" artifact at the edge of the defect that distinguishes it from normal dropout [Figure 1]. At cardiac catheterization we found a large APW with pulmonary to aortic flow ratio above 3 and elevated pulmonary pressure (70% of systemic arterial pressure) [Figure 2]. The patient was operated after diagnosis by transaortic approach using a median sternotomy and cardiopulmonary bypass. The patient had good recovery from operation. His respiratory symptoms decreased after surgery. Echocardiography was performed and showed normal left ventricular function, and no residual aortopulmonary defect. No evidence of narrowing or stenosis of aorta and pulmonary arteries and no distortion of semilunar valve were found by echocardiographic study. Our patient had trivial to mild MR after operation. He is active and asymptomatic at follow-up period (one year). His mild mitral regurgitation is decreased to trivial regurgitation and cardiac function is normal. Several classifications of APW have been presented. One of these classifications separates APW into 3 types, proximal or type A, distal or type B, and total or type C.  Proximal defect which is the most common type is a small defect located between the semilunar valves and the pulmonary bifurcation. Distal defects are located in the upper portion of the ascending aorta before aortic branches near the pulmonary biforcation. The rarest type or total defects consist of the entire aortopulmonary septum. In the past, the diagnostic approach to APW was with cardiac catheterization. 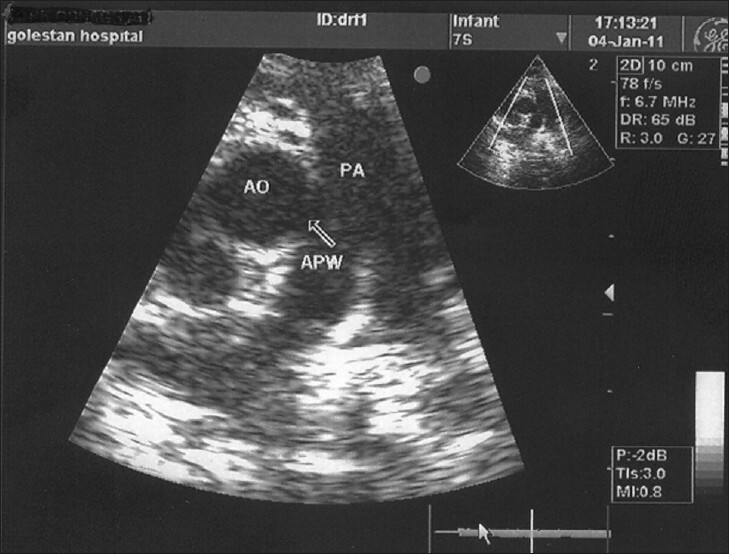 By progressing non-invasive approach, techniques and 2-dimensional echocardiography diagnosis of APW and associated anomalies is facilitated. ,,, The defect can be best visualized from a different views by echocardiographic study, including parasternal short and long-axis views, high parasternal short-axis view and subcostal coronal view. Echocardiographic study helps us to identify the morphological features and typing of the defect, exact location, sizing of defect, and associated cardiac anomalies. At Doppler echocardiography, abnormal continuous forward flow in the pulmonary arteries indicates the presence of an aortopulmonary communication. Cardiac catheterization is indicated for estimating pulmonary vascular resistance and pulmonary artery pressure. Closure of APW is indicated in all patients and it should be performed as soon as possible after diagnosis. Successful repair of an APW was reported from several years ago and many authors have reported their results. First successful repair of an APW using cardiopulmonary bypass was reported in 1957. Putnam and Gross described the transpulmonary approach in 1966. Transaortic direct closure of an APW was first reported by Wright and coworkers in 1968. In 1969, Deverall et al. described the first use of a patch to close an APW. Currently, several patients have had successful closure using various catheter-delivered devices. ,,, Transaortic approach using a median sternotomy and cardiopulmonary bypass was performed for our patient. Neither pulmonary stenosis or distortion nor coronary artery injury was found. During the follow-up period (one year), no reintervention was needed and he had trivial MR. Most patients with APW develop severe clinical symptoms such as congestive heart failure or pulmonary hypertension during early stages of life. Early surgical closure or device employment is indicated as soon as the diagnosis is established to prevent congestive heart failure and pulmonary hypertension. Other cardiovascular defects should be repaired. Repair of APW have good results and indicated as soon as possible, even in early infancy. The outcome of these patients is excellent if correction is performed before complication of disease such as pulmonary hypertension. This work was supported by Cardiovascular Reaserch Center of Ahvaz Jundishapur University of Medical Sciences. 1. Elliotson J. Case of malformation of the pulmonary artery and the aorta. Lancet 1830;1:247-51. 2. Tiraboschi R, Salomone G, Crupi G, Manasse E, Salim A, Carminati M, et al. 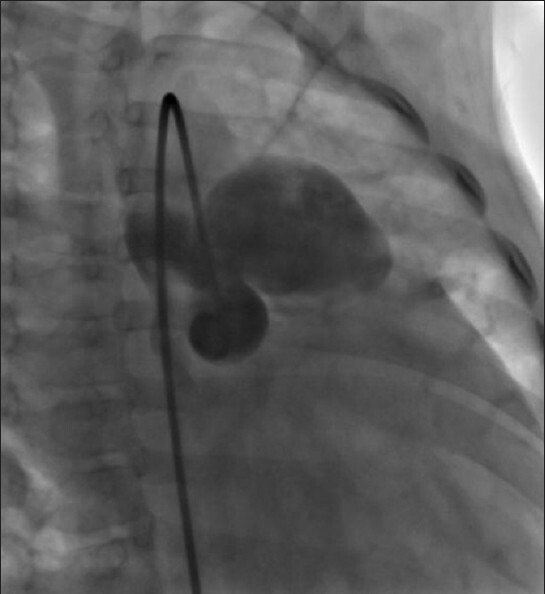 Aortopulmonary window in the first year of life: Report on 11 surgical cases. Ann Thorac Surg 1988;46:438-41. 3. Blieden LC, Moller JH. Aorticopulmonary septal defect: An experience with 17 patients. Br Heart J 1974;36:630-5. 4. Richardson JV, Doty DB, Rossi NP, Ehrenhaft JL. The spectrum of anomalies of aortopulmonary septation. J Thorac Cardiovasc Surg 1979;78:21-7. 5. Berry TE, Bharati S, Muster AJ, Idriss FS, Santucci B, Lev M, et al. Distal aortopulmonary septal defect, aortic origin of the right pulmonary artery, intact ventricular septum, patent ductus arteriosus and hypoplasia of the aortic isthmus: A newly recognized syndrome. Am J Cardiol 1982;49:108-16. 6. Redington AN, Rigby ML, Ho SY, Gunthard J, Anderson RH. Aortic atresia with aortopulmonary window and interruption of the aortic arch. Pediatr Cardiol 1991;12:49-51. 7. Shore DF, Ho SY, Anderson RH, de Leval M, Lincoln C. Aortopulmonary septal defect coexisting with ventricular septal defect and pulmonary atresia. Ann Thorac Surg 1983;35:132-7. 8. Duca V, Sulliotti G, Maggio C, Corsello. Transposition of the great arteries and aortopulmonary window in the same patient: Clinical report and follow-up. Pediatr Cardiol 2002;23:474-5. 9. Takahashi K, Kido S, Hoshino K, Ogawa K, Ohashi H, Fukushima. Frequency of a 22q11 deletion in patients with conotruncal cardiac malformations: A prospective study see comments. Eur J Pediatr 1995;154:878-81. 10. Mori K, Ando M, Takao A, Ishikawa S, Imai Y. Distal type of aortopulmonary window. Report of 4 cases. Br Heart J. 1978 Jun;40(6):681-9. 11. Tkebuchava T, von Segesser LK, Vogt PR, Bauersfeld U, Jenni R, Künzli A, et al. Congenital aortopulmonary window: Diagnosis, surgical technique and long-term results. Eur J Cardiothorac Surg 1997;11:293-7. 12. Mori K, Ando M, Takao A, Ishikawa S, Imai. Distal type of aortopulmonary window: Report of 4 cases. Br Heart J 1978;40:681-9. 13. Jacobs JP, Quintessenza JA, Gaynor JW, Burke RP, Mavroudis. Congenital Heart Surgery Nomenclature and Database Project: Aortopulmonary window. Ann Thorac Surg 2000;69(4 Suppl):S44-9. 14. Gross RE. Surgical closure of an aortic septal defect. Circulation 1952;5:858-63. 15. Wright JS, Freeman R, Johnston JB. Aorto-pulmonary fenestration. A technique of surgical management. J Thorac Cardiovasc Surg 1968;55:280-3. 16. Deverall PB, Lincoln JC, Aberdeen E, Bonham-Carter RE, Waterston DJ. Aortopulmonary window. J Thorac Cardiovasc Surg 1969;57:479-86. 17. Gaynor JW, Backer CL. Aortopulmonary window. In: Mavroudis C, Backer CL, editors. Pediatric Cardiac Surgery. 2 th ed. St. Louis, MO: Mosby; 1994. p. 247-52. 18. van Praagh R, van Praagh S. The anatomy of common aorticopulmonary trunk (truncus arteriosus communis) and its embryologic implications: A study of 57 necropsy cases. Am J Cardiol 1965;16:406-25. 19. McElhinney DB, Reddy VM, Tworetzky W, Silverman NH, Hanley FL. Early and late results after repair of aortopulmonary septal defect and associated anomalies in infants <6 months of age. Am J Cardiol 1998;81:195-201. 20. Hew CC, Bacha EA, Zurakowski D, del Nido PJ Jr, Jonas RA.Optimal surgical approach for repair of aortopulmonary window. Cardiol Young 2001;11:385-90. 21. Backer CL, Mavroudis C. Surgical management of aortopulmonary window: A 40-year experience. Eur J Cardiothorac Surg 2002;21:773-9. 22. Bertolini A, Dalmonte P, Bava GL, Moretti R, Cervo G, Marasini M. Aortopulmonary septal defects: A review of the literature and report of 10 cases. J Cardiovasc Surg 1994;35:207-13. 23. Balaji S, Burch M, Sullivan ID. Accuracy of cross-sectional echocardiography in diagnosis of aortopulmonary window. Am J Cardiol 1991;67:650-3. 24. Cooley DA, McNamara DG, Latson JR. Aorticopulmonary septal defect: Diagnosis and surgical treatment. Surgery 1957;42:101-20. 25. Putnam TC, Gross RE. Surgical management of aortopulmonary fenestration. Surgery 1966;59:727-35. 26. Atiq M, Rashid N, Kazmi KA, Qureshi SA. Closure of aortopulmonary window with Amplatzer duct occluder device. Pediatr Cardiol 2003;24:298-9. 27. Jureidini SB, Spadaro JJ, Rao PS. Successful transcatheter closure with the buttoned device of aortopulmonary window in an adult. Am J Cardiol 1998;81:371-2. 28. Naik GD, Chandra VS, Shenoy A, Isaac BC, Shetty GG, Padmakumar P, et al. Transcatheter closure of aortopulmonary window using Amplatzer device. Catheter Cardiovasc Interv 2003;59:402-5. 29. Tulloh RM, Rigby ML. Transcatheter umbrella closure of aorto-pulmonary window. Heart 1997;77:479-80.